That line from Almost Famous is stuck in my head as I find myself driving up the 5 Freeway, looking for Whiteman Airport just outside of Los Angeles. See, I’ve agreed to observe one of my friend Phil’s first flying lessons. I’ve known Phil since we were five years old. Every bad decision I’ve made or bad one he’s made, we’ve usually been right there next to each other. Do you have that friend that you know where all his “proverbial” bodies are buried? Well, Phil is mine. Knowing what I know about him, the fact that anyone would allow him behind the wheel of any machine let alone one with wings is too comical not to witness. It’s only when John Denver comes on the radio during my drive do I begin to realize this may be the stupidest idea Phil or I have ever had, and we’ve had some zingers. 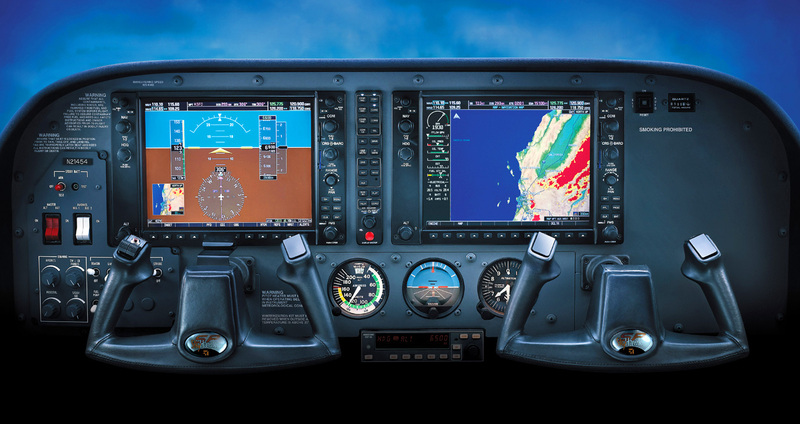 The only reason I’m not in a full-blown panic is because I did some research the other day and learned all about the latest in small aircraft technology: the Garmin G1000. This baby presents flight instrumentation, navigation, weather, terrain, traffic and engine data on high-resolution displays, allowing for unprecedented situational awareness and safety in the cockpit. Basically, it’s idiot proof, which we will be putting to test in spades today. I meet Phil and his instructor, Mike, at Killian Flight Instruction, then head out to the runway and almost immediately realize my error. I will not be getting a glimpse of the Garmin G1000 today. The plane we’ll be taking off in is an old Cessna Skyhawk II built when Studio 54 was open and Elton John was straight. It’s basically a beat up, old VW bus with wings, but smaller. And without the charm. 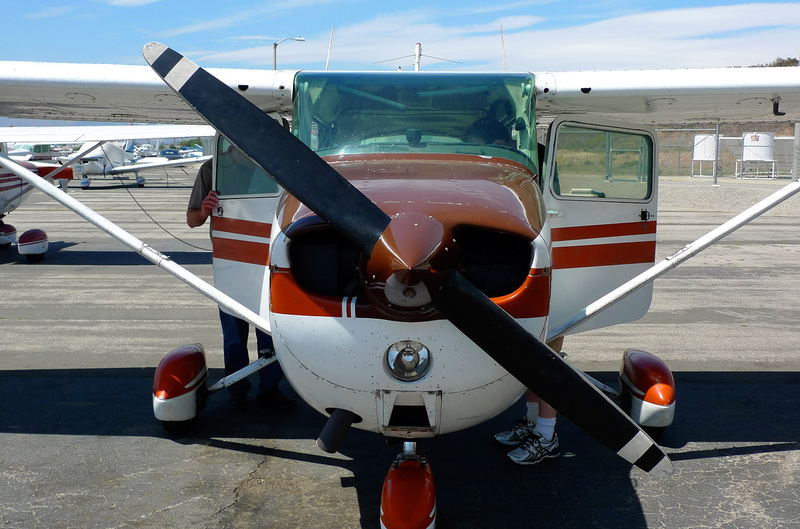 Unlike the sleek, user-friendly technology outfitted in modern cockpits, Phil and Mike will be using gauges that rely on gyroscopes and the measurement taken by devices like the “Static Port”, which is a little hole on the side of the plane, and a “Pitot Tube”, which looks like a straw on the wing, both of which measure pressure due to the motion of the aircraft. 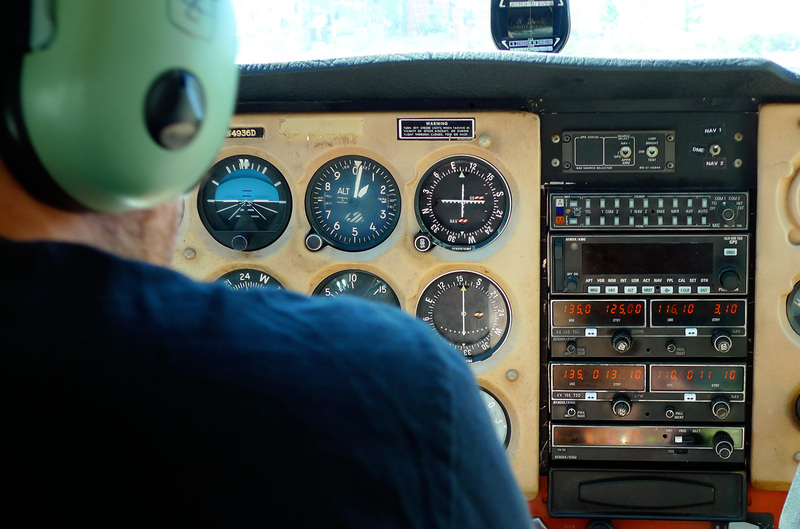 The “Air Speed Indicator” compares those two pressure readings and determines how fast the plane is moving. Inside the indicator is a diaphragm that, when expanded moves the needle. Holes, straws, and a whoopee cushion – what, no ball bearings? I watch as Phil and Mike go through a rigorous inspection of the airplane, (Lava lamp? Check. Shag carpeting? Check. Extremely anxious passenger? Double check) then I jump in the backseat. We lock the doors, close the windows, and start the engine. Before I can say, “Wait, get me out of this death trap!” we taxi down the runway, and take off. And we’re flying! We’re actually flying! In the air! Three dudes in a 40-year-old tube of metal the size of a dining room table, and it’s exhilarating petrifying! Sitting in the backseat I can feel the fragility of the aircraft. Every gust of wind, shift, and overturn seems like we’re a hair away from tumbling towards the earth below us. I grab at my seat and look for a parachute, but I think this plane might have been built before they were invented. Right now Mike is the most important person in my life. “Cause I’m leavin’ on a jet plane, don’t know when I’ll be back again, oh baby, I hate to go…” Oh, go f–k yourself, John Denver. Meanwhile, Phil and Mike go through a series of troubleshooting exercises. “So if you lost power where would you choose to land?” Mike asks. “Over on that fairway?” replies Phil. “Think you’d make it? Let’s find out.” With that, he releases the throttle and our power fades. We’re now gliding down from 5000 feet, pointed at a Par 5 in between the busiest highway on the west coast and Six Flags Magic Mountain amusement park, where thrill seekers purchase a ticket to ride the “Colossus,” a ride that climbs 26 stories, then races down at 85 mph. Pussies. But as I brace for death and do my best to find religion in a matter of seconds, I catch a glimpse of Phil and Mike. They’re not the least bit nervous. They patiently go through their emergency procedures before turning the power back on and soaring back to altitude. They’re not apprehensive or scared because they know this airplane and how it works. I’m frightened to the point that all color has drained from my face because I’m at the mercy of technology that I don’t understand (and a pilot I understand too well, but that’s beside the point). And it makes me realize how often we put ourselves at the mercy of technology that just works without us feeling the need to understand how or why. Nowadays, we take all technology for granted. For example, it’s incredibly easy to take a stunning photo, but how many people know what an F-stop is? Sure, that’s part of the goal of advancement, right? Making things more accessible and easier to use. But not knowing how it works is all fine and dandy until you’re sitting in a beat up airplane at 5000 feet and the power goes out. I wonder if in the process of making things idiot proof, we’re making ourselves idiots. It’s the spirit of figuring out how things work that has enabled technology to lift us to such great heights in the first place. I just hope we don’t lose that curiosity and end up searching for a fairway to crash land in. Cause, honestly, those things are way bumpier than they look from 5000 feet.